Android 3.0 - will we get a mobile version? Google's Android 3.0 OS, codenamed Honeycomb, may never come to the smartphone market. Since tablets have been announced using the new operating system rumours have been abound that a potted-down version will be coming to smartphones. 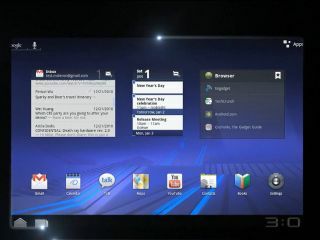 But when asked by TechRadar if the new OS would be coming to mobiles in the future, Dave Burke, Director of Engineering of Android at Google said: "We took the opportunity with Android 3.0 to enhance the UI. "Right now it's a tablet operating system." However, the spokesperson also said that in the future Google would like to unite the numbers systems [to stop Android 2.x being for smartphones and Android 3.x for tablets]. "I think that coming together is a good idea. What we're trying to do here I make a base platform that's so good, that others only need to add native elements in their core areas. "We wanted to make the whole UI better - it shouldn't be necessary to customise the texting widget with the Honeycomb UI. "We don't think one size fits all with Android, but sometimes changes [people make to the UI] miss the point - then again, sometimes it amazes us."